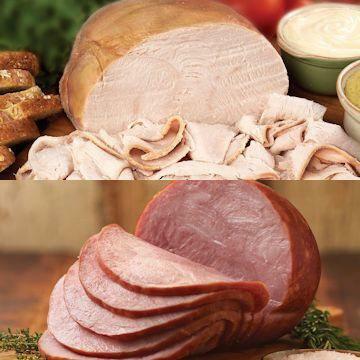 Make your dinner easy and filled with variety with this juicy ham and turkey combo. This Smoked Boneless Ham is a classic... it hardwood smoked to lock in the sweet, juicy flavor. The Oven Roasted Turkey Breast is boneless, skinless and fully cooked for your convenience. Simply slice it and serve. Add some classic holiday side dishes and desserts and you'll have a elegant holiday meal with ease! Thaw in refrigerator. Oven: Preheat oven to 350� F Cover boneless ham tightly and heat for approximately 35-40 minutes. Smoked Ham may be sliced and served cold. Serves 4-6.